Solvent-based Paint Production Line_Anhui Bunkin Chemical Machinery Co.,LTD. Application:Suitable for manufacturing of solvent-based paint including nitro lacquer, polyurethane paint, enamel, varnish, anti-corrosion paint, finishing varnish, epoxy paint , etc. solvent-based production line ranges from single equipment with 500T/year capacity to complete production line with 100,000 ton/year capacity. We have successfully serviced customers from various of industries including nitro lacquer, polyurethane paint, enamel, varnish, anti-corrosion paint, finishing varnish, epoxy paint, etc.. Solvent-based paint complete line consists of raw materials auto feeding system, metering system, dispersing and milling system, tinting system, filling system, auto control system, platform and color paste manufacturing part. The entire production line from charging, discharge to packing is totally automatic with high efficiency. And the international advanced dispersing and milling machine ensures nice products fineness and quality. Application:Suitable for manufacturing of solvent-based paint including nitro lacquer, polyurethane paint, enamel, varnish, anti-corrosion paint, finishing varnish, epoxy paint , etc..
solvent-based paint production process contains following steps: batching, dispersing, milling, tinting, filtering and filling. Dispersing: Powder are equably dispersed into liquid by high speed disperser which generates uniform white paste without aggregation. 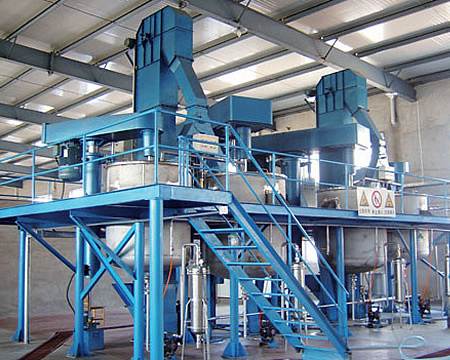 Multiply of specifications are optional: disperser with scraper, vacuumed disperser, dual-shaft disperser(butterfly type+dispersing), platform type , etc., to meet different requirements of dispersing and mixing working conditions. Milling: adopts international advanced milling technology, horizontal beads mill is mainly applied in plant and basket mill applied in color paste milling. Tinting: various types and specifications are optional such as vacuumed type, ex-proof type, single shaft type, dual shaft type, tri-shaft type , etc.. according to production process and materials characteristics, such as viscosity, specific gravity. Filling: filtered product are filled whose specification is normally1-5ke and 10-25kg. Semi-auto or automatic filling machine are optional. Dispersing system adopts disperser with multi-vessel with a rotation system to adjust its working position, which improves the usage rate to large extent and reduces the cost of equipment and the space. Milling system adopts international advanced horizontal beads mill, moreover, several devices can be series connected, though this method, once grinding can meet the fineness requirements. In terms of color paste milling, basket mill is available, which is easy to clean and suitable for multiply of color paste. Dispersing device: fixed dispersing kettle, lifting dispersing kettle. Milling device: Horizontal bead mill, basket mill(for color paste) .